The site of a company manufacturing brake linings was underlain by soils contaminated by asbestos. The site was on the Superfund project listing and the entire site clean-up was managed by the U.S. Army Corps of Engineers. The clean-up included dynamic compaction and wick drains, depending upon the area of the site. All work was performed under 29CFR 1910.120, including 40 hours of OSHA Hazardous Waste Worker Training for each person on site. Air quality monitoring was performed by Foster-Wheeler Environmental Corporation to assure that no air-borne contaminants were released. Dynamic compaction was performed with two cranes using drop weights of 10 and 15 tons. 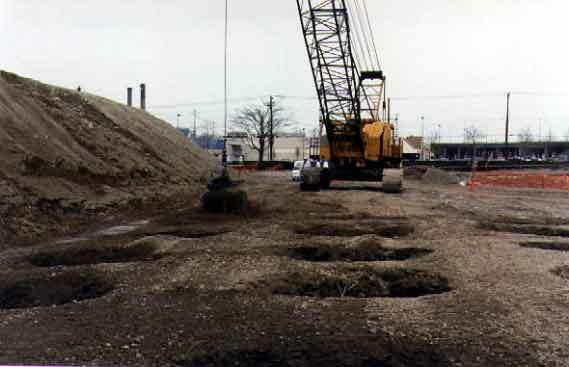 Crater depths were limited to five feet deep before backfilling and continuing the tamping operations. Due to the proximity of an adjacent shopping center, vibration monitoring was an integral part of the compaction operations.